Children 5 years and older are admitted. No babes in arms. 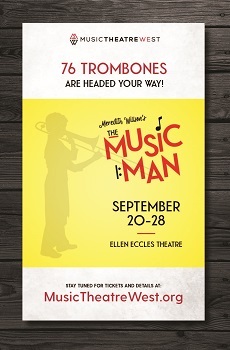 Wicked, funny, warm, romantic and touching, The Music Man is family entertainment at its best. Meredith Willson's six-time, Tony Award-winning musical comedy has been entertaining audiences since 1957 and is a family-friendly story to be shared with every generation. Performances held at the Ellen Eccles Theatre.